Battling Bread | What Smells So Good? potato *and* corn? it's like my two favorite breads rolled into one! Sorry, maybe I'm showing my ignorance...but what is potato water? OMG!That breads luk so pro and enticing to look at. 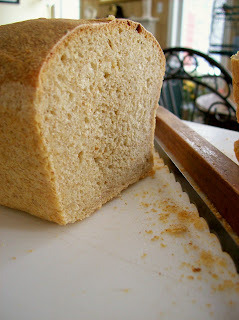 I have made Potato Bread before but not with the wholemeal and corn combo. This one luks absolute delicious. Thanks for sending it my way! OK, that idea of a cold rise? WAY cool! I've done it with the first-stage rise, but not later rises ... and I don't know why, really, except that the idea of cramming 4 loaves into the fridge is kind of daunting, whereas leaving all the dough in one bowl ... just isn't. Strange. Thanks!